The farm-to-table concept which is gaining ground in China originated in the United States as a social movement encouraging restaurants to source ingredients directly from local farms to ensure freshness. The idea grew rapidly among restaurants worldwide, including the Michelin-starred restaurant French Laundry in California, with its own culinary garden, and Copenhagen’s Noma, which has its own farm. In Shanghai over the past few years, several innovative restaurants have established partnerships with local or nearby organic farms. 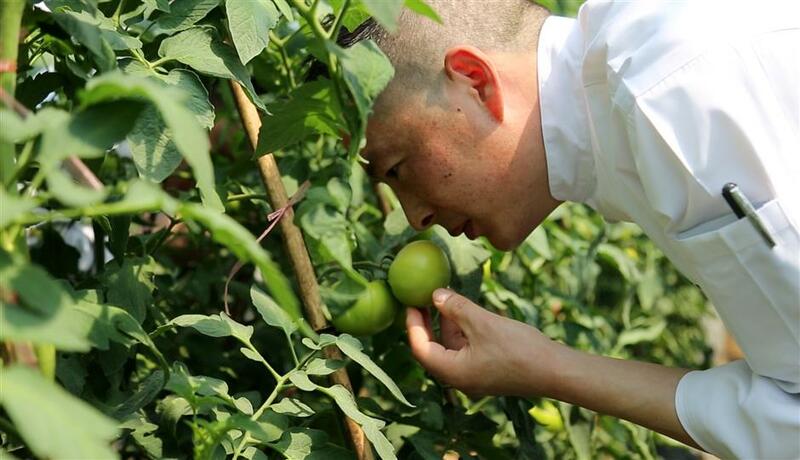 It’s organic farming that can ensure food safety, and more importantly, enhance the taste, said Hyatt on the Bund chef David Du. 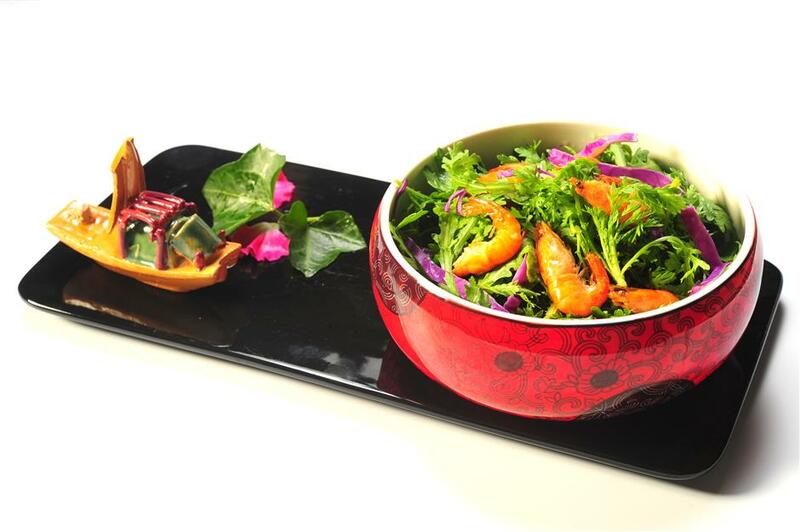 Du recently launched his “farm-to-table” menu at the hotel’s Xindalu Chinese restaurant based on hotel’s sourcing agreement with Shunhe Organic Farm in Fengxian District. “When comparing the organic food with the normal, you’ll strongly feel that the former tastes much more flavorful, reflecting the local terroir, and reminds me of the flavor back to the 1960s,” Du said. Du points to a local distinctive vegetable called “Shanghai green” as an example. The organically farmed vegetable has a distinctive sweetness and slightly glutinous texture, which is perfect when stir-fried with lard. Organically farmed potato, eggplant and tomato also present big differences from those normally farmed. However, finding a real organic farm in China is not an easy job, the chef said. Organic farming excludes the use of additives, pesticides and fertilizers with the result that crops grow more slowly and yields are lower. More work is required to eradicate pests. This makes the final product more expensive. “Most of the organic farms in China can only live by big clients such as hotels and fine restaurants,” said Du. 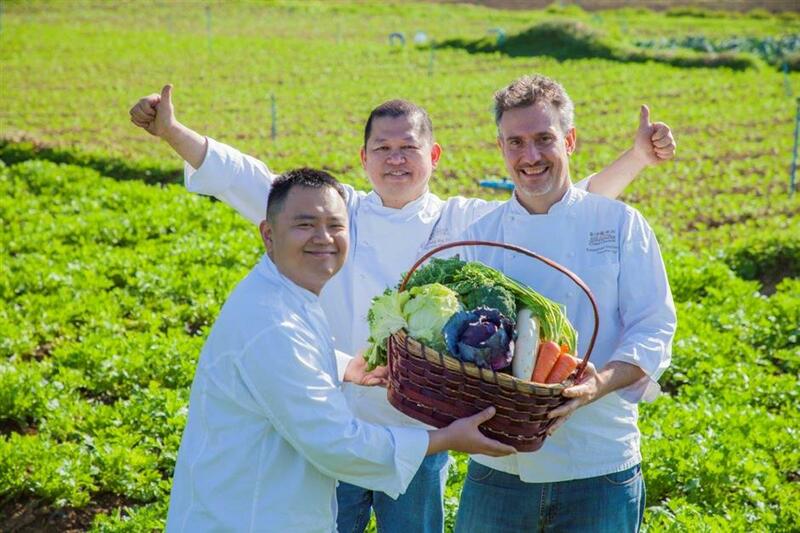 Chef David Du sources vegetables at Shunhe Organic Farm. Strict farming standards limit the size of farms, and the variety of produce. 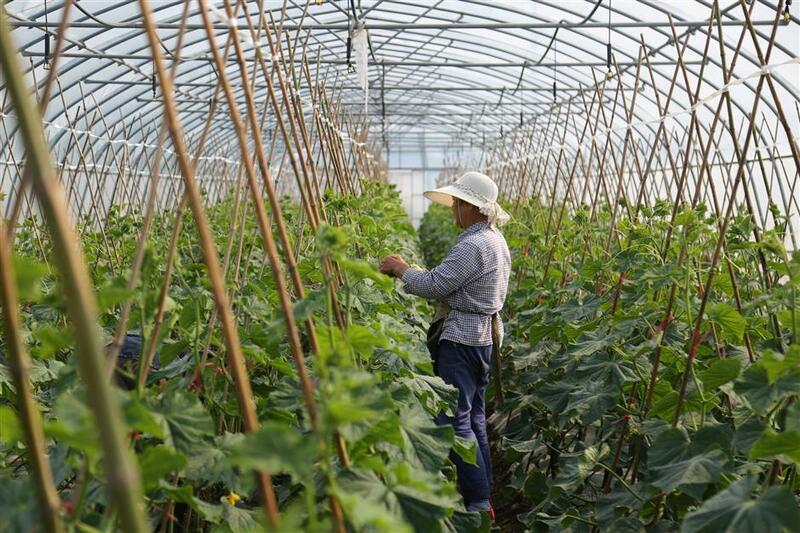 Shunhe Organic Farm, for example, produces just eight different vegetables, which can be seen as diverse in Shanghai. It keeps chicken, ducks and geese, though, with the aim of building its own ecosystem. “The geese will eat weeds and rotten leaves while the chicken eat insects and snails are food for the ducks,” said farm owner, who only identifies himself as Ge. Du is not sure whether Chinese diners are willing to pay for such expensive concept. Organic ingredients put up the restaurant prices by 30 percent at least. Despite that, he believes seeking freshness and safety is a general trend in the long run, no matter how expensive it will be. We have picked three hotels dedicated to promoting “farm-to-table” thinking. Summer is in the air, so let’s find something fresh and delicious. A farmer at Shunhe Organic Farm in Fengxian District eradicates pests by hand. Chef David Du’s new menu has five seasonal dishes. “Organic ingredients are fresh and flavorful so I try to use simple techniques to present their original beauty,” he said. Eggplant is tossed in aged vinegar and topped with sea urchin; chilled tomato is flavored with preserved plums; mushrooms are simply boiled with tomato and pumpkin. The chef’s dishes also express a strong local touch, represented by fired baby potato with spiced salt and wok fried river shrimp with cucumber. 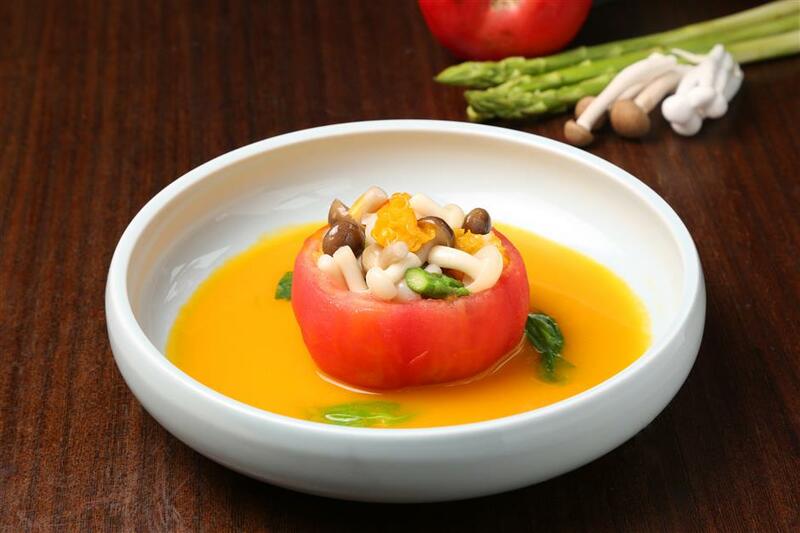 Composed of seven properties along Cotai Island, the Sands Resorts Macau have launched a selection of spring menus featuring 30 seasonal vegetables from organic Golden Farm in Conghua District, Guangzhou. The menu is available at more than 10 restaurants until the end of June, including Dynasty 8, Rice Empire, Lotus Palace and The Golden Peacock. Carefully considering quality, taste and provenance, chefs from the resorts visited the farm to inspect the produce and test soil samples. Chefs from the resorts consider that using organic ingredients, with higher levels of vitamins and minerals, not only means a better flavor but also benefits health. Macau lacks local ingredients so chefs used to import ingredients from overseas. Sourcing produces from neighboring places is also way of reducing their carbon footprints. Chefs from Macau source organic food ingredients in Guangzhou. The resort was one of the earliest in China to practice the farm-to-table concept. The resort established its own organic farm called Yue Feng Island, covering 200 acres. It grows vegetables and fruit for the hotel’s three restaurants. At Wugu Restaurant on the farm, diners can taste the food while enjoying the view across rice fields. According to hotel’s Chinese kitchen executive chef Martin Li, over half of the dishes at Wugu are made from organic produce. Li recommends the tossed river shrimp with crown daisy, featuring a sweet and mild taste with an appealing herbal fragrance. Pumpkin steamed with osmanthus flowers and shredded cucumber with garlic is another highlight. There’s a culinary studio beside the restaurant where guests can learn how to cook organic ingredients. Honey from the farm is also on sale.